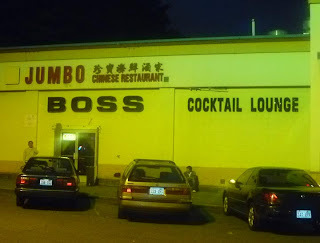 The Grand Jumbo Chinese Restaurant is not prone to understatement, and above the door to the lounge there are large letters spelling out "BOSS," which makes me wonder if it is actually the Grand Jumbo Boss Lounge? 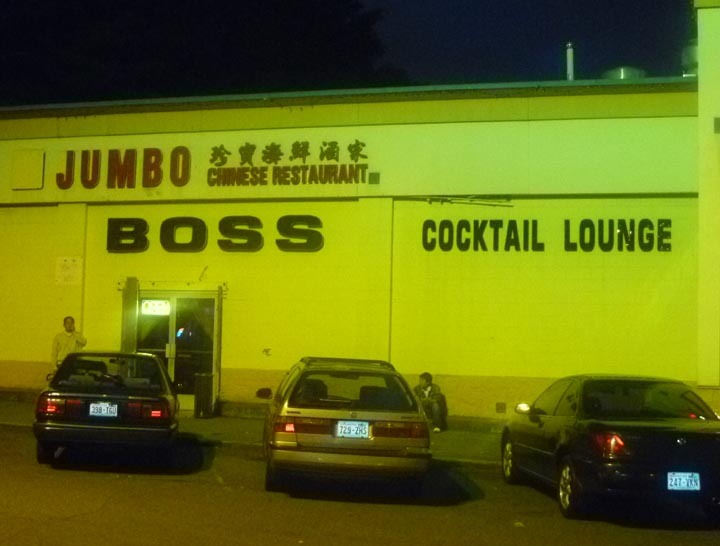 I didn't have the opportunity to eat there, and at 10-ish on a Thursday evening the large space hosted only one large table of patrons taking turns singing Vietnamese karaoke, and three or four more sitting at the bar. The lounge is partitioned off in the manner of hotel meeting rooms, and my googling indicated that it sometimes hosts raves. The gals working the bar were apologetic that their regular bartender was not there to prepare cocktails, but they were very solicitous in gathering the ingredients for a gin and tonic. As the web site notes (to the tune of a lilting piano), "In 2009 the GJR proudly welcomed Danny to the management team. Danny is kind, accessible, and very always entertaining." The complete text of the "Bar" page is currently "Bar Menu: Bar." I didn't meet Danny, so I can't personally confirm that he is very always entertaining, but the people working the bar were very pleasant and attentive.